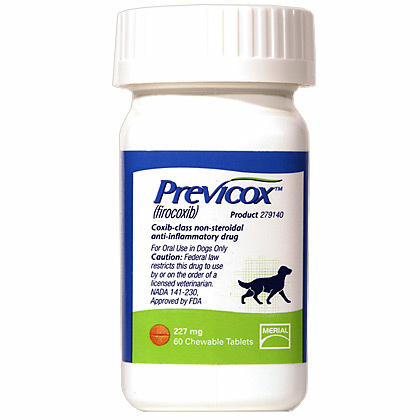 Previcox is a Cox-2 non-steroidal anti-inflammatory medication used in dogs for the relief of pain and inflammation due to osteoarthritis. It may also be used for purposes other than those listed here. Previcox works by reducing substances that cause pain, inflammation, and fever in the body. Previcox requires a prescription from your veterinarian. Before giving your dog any other prescription or over-the-counter medications talk to your veterinarian or pharmacist. Keep this medication away from children and pets. What is the most important thing I should know about Previcox? Previcox is a prescription medication that is FDA approved for use in dogs 7 weeks of age or older. 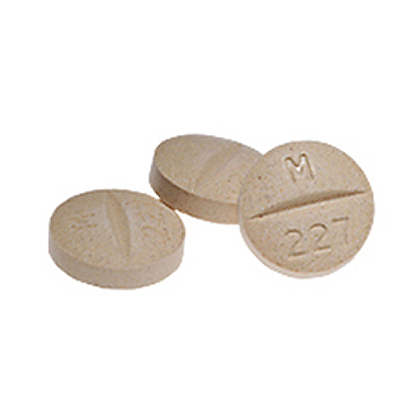 Previcox is available as 57 mg and 227 mg chewable, scored tablets. Contact the veterinarian if the pet has hives; or an allergic reaction after taking sulfa-based medications such as SMZ/TMP, aspirin or another NSAID such as Rimadyl. Notify your veterinarian immediately if your pet develops abdominal pain; tenderness or discomfort; nausea; bloody, black or tarry stools; water retention; fatigue or lethargy; skin rash; itching; yellowing of the eyes; unusual bruising or bleeding as these symptoms could be early signs of dangerous side effects. Before giving your pet any prescription or over the counter medications check with your veterinarian or pharmacist. What should I discuss with my veterinarian before giving Previcox to my pet? Tell your veterinarian if your pet has an allergy to aspirin or any other NSAID. Also inform your veterinarian if your pet has an ulcer or bleeding in the stomach, liver or kidney disease, congestive heart failure, fluid retention, bleeding disorders, heart disease or high blood pressure. Tell your veterinarian if your pet is pregnant or lactating. Tell your veterinarian if your pet is taking a steroid medication such as prednisone, methylprednisolone or Prednisolone. How should Previcox be given? Give this medication exactly as directed by your veterinarian. If you do not understand the directions ask the pharmacist or veterinarian to explain them to you. The usual dose of Previcox in the treatment of osteoarthritis pain and inflammation is 2.27 mg/lb as a single daily dose. Previcox can be given with or without food. Keep plenty of water available for your pet. Do not give Previcox to cats. What are the potential side effects of Previcox? Contact the veterinarian if the pet has abdominal pain, tenderness, or discomfort; bloody, black or tarry stools or blood in vomit; unexplained weight gain; water retention; fatigue or lethargy; skin rash; itching; yellowing of eyes; unusual bruising or bleeding as these symptoms could indicate serious side effects. If any of the following serious side effects occur, stop giving Previcox and seek emergency veterinary medical attention; an allergic reaction (difficulty breathing; swelling of the lips; tongue or face; hives). Other less serious side effects may occur. Continue giving Previcox and talk to your veterinarian if your pet experiences flatulence or diarrhea; dizziness; headache; or insomnia. Other side effects may also occur. Talk to your veterinarian about any side effect that seems unusual or bothersome to your pet. What happens if I miss giving a dose of Previcox to my pet? What happens if I overdose my pet on Previcox? What should I avoid while giving Previcox to my pet? Many over the counter cough, cold, allergy and pain medicines contain aspirin or other NSAID's similar to Previcox. Before taking any prescription or over the counter medications talk to the veterinarian or pharmacist. What other drugs will affect Previcox? Tell your veterinarian if your pet is being given aspirin; another NSAID such as etodolac, carprofen or piroxicam; an over the counter cough, cold, allergy or pain medication; warfarin; furosemide; an ACE inhibitor such as enalapril, a steroid such as prednisone, insulin; or probenecid. Drugs other than those listed may also interact with Previcox. Talk to your veterinarian before giving your pet any prescription or over the counter medicines. Previcox is a prescription medication. Previcox can be given with or without food. Store Previcox at room temperature, away from moisture and heat. Keep this medication away from children and pets.